Charles Frazier, an American novelist had once observed, "disease is nature's revenge for our destructiveness." Dengue, according to a standard dictionary is an acute febrile disease of the (sub)tropics caused by the Dengue virus, a flavivirus, transmitted by Aedes mosquitoes, and characterized by high fever, rash, headache, and severe muscle and joint pain. It is a global hazard since 100 countries have come under its impact so far - worst in Asia. In West Bengal this is being escalated by West Bengal Government's lack of fighting spirits. Calcutta witnessed unplanned growth of urbanization without any drainage and road and a steady decline of civic service. The culture of cleanliness is being mocked by the state agencies. In the cesspool of political authoritarianism, meaningless bureaucracy and endless corruption, the disease has spiraled out of control. With the sudden drop of temperature below 20°C, the scourge of dengue has definitely got lessened in West Bengal. Yet a change of season cannot minimize the apathetic attitude that the government has shown towards the citizens. The way it handled the situation since the onset of monsoon, it can only invite severe condemnation. The government tried to suppress the facts including the real cause of disease due to negligence in clearing rubbish or bleaching neighborhoods. It directed medical practitioners to conceal the truth, reveal nothing of the government’s failure to tackle the situation and neglect those affected by the disease. To safeguard the health of the citizens an elected government must strive hard but all effort was directed at to trivializing the disease and its intensity. Chief Minister tried her best to relieve the government of its social duties by misguiding the people, by suppressing the real reason behind the epidemic. Medical practitioners have been forced not to write the name dengue but to describe it as an ‘unknown fever’ (ajana jwar). The lower rung of society have faced the worst brunt of this policy of deliberate suppression and apathy as they had to depend on the state hospitals for treatment. The bulk of the patients who have died were poor and indigent. The government actively obstructed treatment. 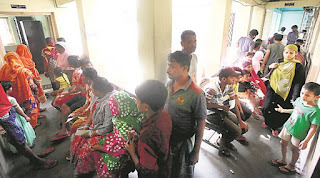 Kolkata Municipal Corporation ordered all private pathology laboratories to hand over blood samples that had tested positive for dengue for a second test. The state government even accused private hospitals making profit by manufacturing spurious dengue patients. Doctors are not being allowed to state "dengue" as the reason of death in death certificates even though it's true. The Bengali language daily 'Ananda bazaar Patrika' published such a story: Anjana Kundu of Bongaon town said her husband was diagnosed with dengue but the doctor at a Kolkata nursing home wrote “sudden cardio-respiratory arrest in a case of sepsis and multiple-organ failure” on his death certificate. The Centre told the Calcutta High Court that West Bengal has failed to utilize the funds provided to it for controlling vector borne diseases including dengue in the state. High Court expressed concern over the outbreak of dengue in West Bengal, saying more needs to be done as current steps seem inadequate. But the Government continues to remain inactive. The disease has been at the centre of a vociferous political controversy in West Bengal. Leftists organised deputations regarding the carelessness of the state government to the state governor. Congress workers protested against the dengue situation in front of the Kolkata Municipal Corporation headquarters. The opposition, one of the main pillars of democracy, has been ignored. They did not get any scope to discuss the matter in the assembly. Honest doctors were harshly punished by the state. Arunachal Dutta Chowdhury, a senior doctor working at a state run hospital in North 24 Parganas fell prey to government's ire because he had put up a Facebook status claiming that the dengue epidemic is getting out of hand. In this sense, this state government is no different from the Yogi government or the Modi government. The name of the game is scapegoating and victimization of doctors. While many of us are applauding her bold step in providing "Padmavati" a special screening in the state, the CM is going out of her way to suppress any kind of widespread public discussion about the dengue epidemic. This exposes the double standards in her standpoint. Ms. Banerjee, who is also Health Minister, has assured people via press that any municipality found to be slack in fighting off the dreaded disease, will be dissolved by her government, as taking care of the people of the state is her primary concern. Yet she has also proudly declared also that in terms of numbers, West Bengal is better off than the states of Gujarat or Madhya Pradesh. For a leader who is so invested in her people's well-being, quantifying deaths seems to be a contradictory and brutally insensitive reaction. My personal experience: the municipal "smoke tank" (as we used to call it as kids) came into my locality, projecting a lung-irritating smoke right into the houses sitting tranquilly on the either side of the widest road. What happened to the houses hidden deep in the alleys? Do not ask. For how many days did they do it? Do not ask. Is it even effective to fight off the mosquitoes that cause the "disease that shall not be named"? Do not ask. For all questions asked are branded as propaganda in today's politics. The Opposition is aware of this. Bengal BJP president Dilip Ghosh has mocked Banerjee as “Dengue-shree”, a dig at the state government’s award-winning Kanyashree Prakalpa programme that aims to keep girl children in school. He is naturally silent on the anti-people health policy of the BJP-ruled states, the drastic slash in UP health budget etc. Meanwhile, a poster of a giant mosquito has suddenly appeared on the Kolkata Municipal Corporation premises with the words, “This is not a mosquito. This is an unknown insect.” Words fail in the face of such charades. Health education and awareness drives have been tossed aside by the government. Instead it has decided to go for short cuts: suppression of death figures . Yet the cold hard fact is dengue, a Spanish word for bone pain,is a brutally efficient killer. Awareness programs have been few and far between. All party meetings with the aim of issuing public advisories is the urgent need of the hour to fight the constant outbreak of this deadly infectious and other diseases each year. Concrete steps and proper medical treatment must be provided to prevent outbreak of epidemic and save lives. Dengue can be contracted by people of any age but the most vulnerable ones are the children and aged. In 2016, 22,865 patients suffered this disease in West Bengal and the death toll climbed up to 45. This year so far, 10,697 have been affected and 38 people have died. Unofficial figures are much higher. The last count is yet to come. Ushashi Paul is a third year student of Philosophy at Jadavpur University.